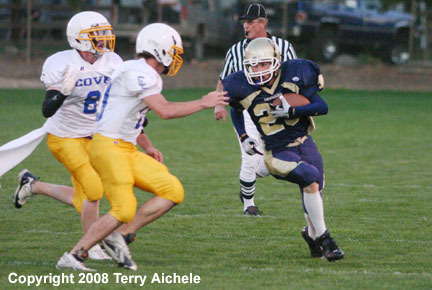 ECHO - The Echo Cougars (1A Big Sky - East) hosted Cove (1A Special District 4) in a Thursday night football game. 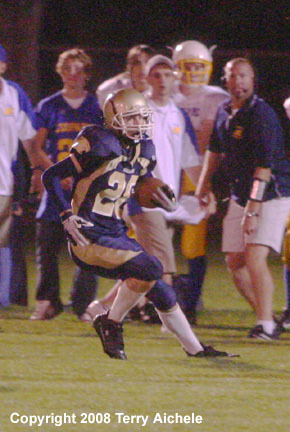 Cove's first touchdown came on a punt return at the end of Echo's first possession. The return was about 40 yards for the score. The two point attempt was no good to give Cove a 6-0 lead at 9:44 of the first quarter. Echo's opportunity to put points on the board came late in the first at 1:44 to go when they took over first and ten on about their 15 yard line. 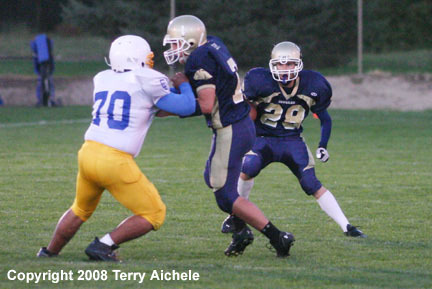 Early in the second quarter a major face mask penalty against Cove gave Echo an opportunity to keep the drive moving. 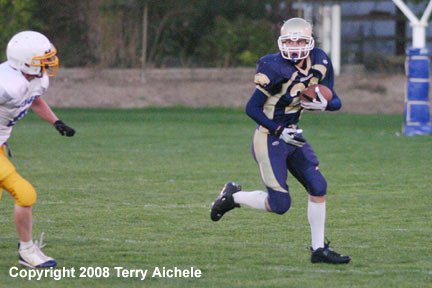 Andy McFarlane then connected with Colter McCallum to take the Cougars to the Cove seven yard line. Then McFarlane hit McCallum in the endzone for a touchdown. The two point attempt was a pitch to Mike Fisher good for two points. Echo took the lead 8-6. Then came a little excitement. Echo attempts an onside kick that Ryan Ramos caught like a pass going down field with Leopard players asleep. Ryan Ramos ran all the way to the endzone. Then the referees conferred for awhile and came to the conclusion that the ball was down where Ramos first touched the ball. Instead of at least a lead of 14-6 Echo had to make do with the ball back on about the 50 yard line. With 4:20 to go in the second Cove quarterback Jered Witty handed off to Justin Brainerd who then went 50 yards for a touchdown. The two point attempt was good to take a 14-8 lead over Echo. Echo scored on the next series of play with a pass from McFarlane to Ryan Ramos at 3:10 to go in the second quarter. McFarlane was swarmed over on the two point attempt. The teams were tied 14-14 and that was the score at the end of the first half. Cove scored on a run at 6:53 of the third quarter. The two point attempt was good to give Cove the 22-14 lead. With Cove just yards from the Echo endzone and 3:50 to go in the fourth two penalties on the Leopards, including an unsportsmanship penalty, sent Cove backing up 20 yards. Witty put up a pass near the endzone and it was picked off by Echo's Andy McFarlane. Cove racked up a number of big penalties during the remaining minutes of the game. Echo had a pass intercepted to finish their scoring opportunities in the last minutes of the game. LEFT - Echo's Colter McCallum runs around a block. RIGHT - Colter McCallum makes tries to make his away around a Cove defender. LEFT - Echo's Colter McCallum tries to make his way around the corner on a run. 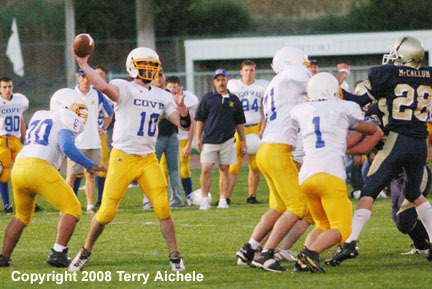 RIGHT - Cove quarterback Jered Witty lets fly with a pass. LEFT - Colter McCallum on a big pass reception that helped to set up an Echo touchdown. 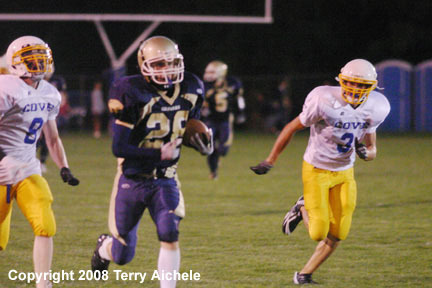 RIGHT - Colter McCallum being chased by two Cove defenders. 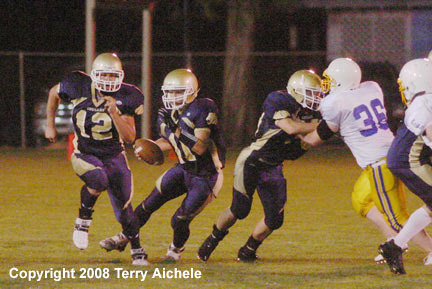 LEFT - Echo quarterback Andy McFarlane sets up for a pass. 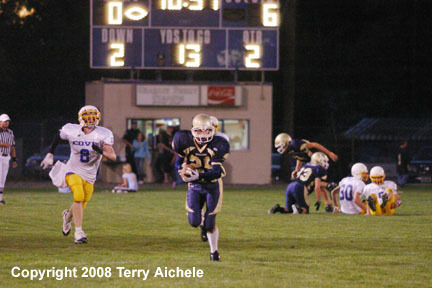 RIGHT - Colter McCallum running down the sideline.